The cidery and the winemaker have joined forces at their lively north Boulder tasting room. A small business district in north Boulder is quickly becoming one of the best blocks in town for craft booze lovers. On March 27, Decadent Saint Winery reopened with a new look and a new roommate: Wild Cider. Four-year-old Decadent Saint—which shares a parking lot with neighbors like Upslope Brewing Company, Settembre Cellars, and Bookcliff Vineyards—recently relocated its production operations to a Louisville facility, freeing up an enticing piece of real estate in the back of its north Boulder building. Firestone-based, four-year-old Wild Cider happily moved in. 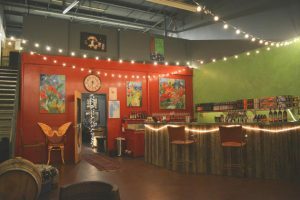 The revamped tasting room is large and open, accented by vibrant colors, and features community-style seating and a bar adorned with cider taps and rows of wine bottles and cider cans. A stationary, vintage RV-turned-pizza truck called Hot Tin Roof Pizza—the brainchild of Wild Cider co-owner Adam Gorove—is parked inside. Gorove initially launched the pizza business in order to provide food at the cidery’s original outdoor tasting room. Now, the truck is dishing up health-conscious pies for the Boulder crowd, including a tasty gluten-free option. The Decadent Saint Winery and Wild Cider joint tasting room features a large selection of both brands’ products. 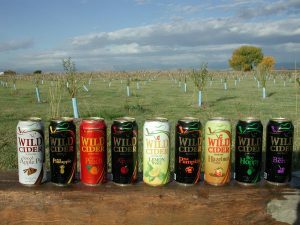 Wild Cider is pouring year-round and seasonal offerings (including the most popular flavors, apple, pear, and apple pie) from eight rotating taps, and four-packs and mixed eight-packs of its cider are also available for purchase. From the same bar, guests can try a variety of Decadent Saint Winery’s award-winning sangrias (which customers can also purchase in concentrated 750 milliliter bottles) as well as vinos from the winery’s reserve collection.